The Kabardian (Circassian) breed of horses and the institution of the horsemanship has its history which comes up to 2000 years. Caucasian, Karabakh, Mongolian and Arabic breeds effected greatly a formation of the Kabardian (Circassian) horses. Besides that climatic conditions, Alpine meadows, mountain fresh air , and spring water of the Caucasian glasiers had a great influence on them. The Kabardian (Circassian) horse breed has been highly appriciated for its incompetable merits such as specific endurance, unpretenciouness, strong hoofed horn and special character good for military activities. The Kabardian (Circassian) horse is the best in highlands because of its ability to keep balance while moving up and down along the slip rocky roads. A developed physical power and endurance allows it to make 100 km a day loaded up with 150 kg. The Kabardian (Circassian) horse was tested in several distant races. One of the outstanding race in the history of the horsemanship was a horse race round the Caucasian mountain ridge on a distance of 3000 km in winter 1935-36. It was the itenarary through Pyatigorsk - Sukhumy - Nalchik - Kutaisy - Tbilisy - Baku - Makhachkala -Grozny - Vladikavkaz - Nalchik - Pyatigorsk. This very difficult way, when one had to get over Sulamski and Klukhorski passes, had been made for 47 days. After that the participants of the race have covered 600 km from Pyatigorsk to Rostov for 5 days. In 1994 in Saint-Petersburg within the program of Russia fair "Russia farmer-94" a race Moscow-Saint-Petersburg was held. On three horses of the Kabardian (Circassian) breed 700 km were made for 6 days. In 1991 within the Ecological program "My friend- horse" 2063 km were made by the rout Moscow-Novgorod-Ivanovo-Frankovsk. There were horses of the Kabardian (Circassian) breed. Traditionaly the Circassian breed have been raised in Kabardino-Balkarian and Karachai- Circassian Republics. But nowadays the horsemanship in Kabardino-Balkarian as well as in Russia was decayed. Many local breeds including Kabardian (Circassian) one is likely to disappear. For the last 15 years nobody attended to horse selection. The breed have been changed for worse as in quality so in quantity. Only less than 500 horses of 2000 in the Republic meet the breed characteristics. Today just innumerous enthusiasts try to save the breed. There is a farm "Guaran"-the owner is Ibragim Yaganov- where such horses are raised. The herd of horses consisted of 150 mares is pastured on the territory of 34 hectares and the farmer has all necessary facilities. 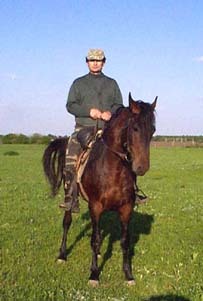 The Kabardian (Circassian) breed can be effectively used for the military purposes , in horse police, tourism, hunting and horse racing. Inspite of the high results we have no possibility to take part in distant horse racings and other events because of the financial problems and taking into account that the State doesn't support this branch. We would like to contact with all who will take interest in this information in order to save, develop and use this precious breed.